I am a big fan of the Sea Buckthorn which has an impressive nutrient Omega-7 content and one of the best resources for high quality products containing organic Sea Buckthorn is SeabuckWonders. They are proud of the newest product in the personal care line including Himalayan Sea Buckthorn Exfoliating Facial Cleanser, Himalayan Sea Buckthorn Body Lotion, Himalayan Sea Buckthorn Deep Hydrating Serum and Himalayan Sea Buckthorn Facial Cream. I became familiar with the Sea Buckthorn when my youngest son suffered from a serious third degree burn to his arm in a campfire accident. He has significant scarring but on recommendation from his rehabilitation therapist, we diligently applied Sea Buckthorn oil to the healing scar every day and it is noticeably more soft and supple than ever expected. What makes SeabuckWonders such an exceptional product line? There are so many positive features included in the making of their products including the fact that it is paraben-free, cruelty-free, vegan, non-GMO and Gluten-free. 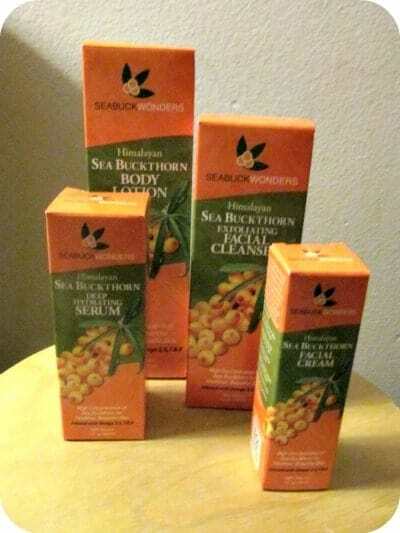 I was very impressed to learn that SeabuckWonders products use USDA Certified Organic Himalayan Sea Buckthorn which is 100% pure and has a “supercritical oil extract” which contains “essential fatty acids including Omega 3,6,7,9, Vitamin E and 190+ bioactive nutrients.” What this means for my skin and hair is that it can provide moisture, nourishment and healing properties naturally! I love the Himalayan Sea Buckthorn Exfoliating Facial Cleanser ($16.97) which is refreshing and invigorating to my skin and cleanses off all of my make-up and residue leaving behind soft, clean skin that never feels dry or stripped. It has a very gentle exfoliating property which I really like because it makes my skin have a nice, clear glow. After cleansing, I use the Sea Buckthorn Deep Hydrating Serum ($34.97) which is surprisingly light-weight but gives my naturally dry skin a boost of moisture as it absorbs effortlessly into my skin. I apply it around my eyes and to the fine lines on my forehead. It is designed to help support collagen production and is great for all skin types according to the company….I especially like using this product for my aging, sun damaged skin! For more intense moisture, I then apply the Sea Buckthorn Facial Cream ($19.97) to my entire face and neck because it has so much moisture infused in this light-weight formula that my skins seems to instantly soak it in and there is absolutely no greasy residue. My skin is soft and smooth and looks great naturally or as a canvas for make-up on special occasions. The Sea Buckthorn Body Lotion ($14.97) is like a treat for my body and my dry, scaly (sorry for the description) legs and arms feel amazing when using this product. I like that it has protective UV properties because as a lifelong Florida native, I am trying to product my skin from the harsh sun. You are invited to visit the SeabuckWonders website to learn more about this wonderful personal care line and select the products that would work best for your skin by shopping in their online store or find a retailer near you. The Berry Oil sounds great! I learned that their farmers practice sustainable harvesting methods. Only the minimum number of branches and leaves necessary are removed, leaving the majority of the plant intact, to continue to grow for the next season’s harvest. I would love to try the Sea Buckthorn Exfoliating Facial Cleanser. I have very dry skin and sometimes it will get flaky in the winter and it’s a pretty awful, embarrassing thing. It’s hard to find a good exfoliate that will help get rid of dead skin cells. i really want to try the ea Buckthorn Berry Oil and i love that they are a company that does not test on animals!!! I learned and like that Sea Buckthorn is involved in sustainability and soil erosion projects. I would love to try the facial lotion. I would like to try the Berry Oil. Besides the prize products, I would love to try the seed oil. I learned that they don’t do any testing on animals. The exfoliating facial cleanser is the product I’d like to try. I’d like to try their Anti-Dryness Kit. 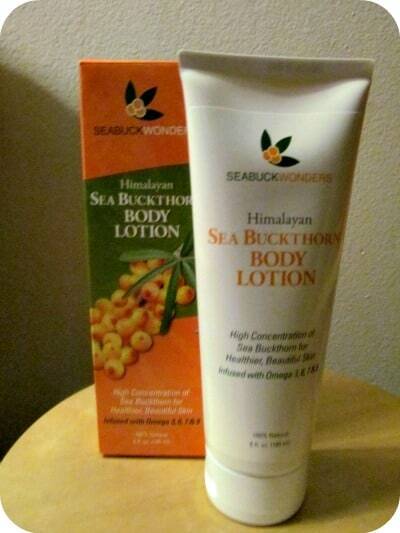 I want to try the seabuckthorn body lotion. I learned that their 100% pure Sea Buckthorn oil naturally contains up to 30-35% Omega-7, the highest concentration on the market, and has wide applications in cerebral- cardiovascular, liver, gastrointestinal, urinary, gynecological and immunological health, as well as skin health. Thanks for having the contest. That all of their products are made by using pure Himalayan ,wild grown,handpicked,organic Sea Buckthorn Berries. I would like to try the Sea Buckthorn Body Lotion. I would love to try the Nourishing Facial Cream. The Sea Buckthorn berry oil sounds like just what I need. I have a hard time not burning myself. when I use sthe oven. Always looking for a good lotion – would love to try the Sea Buckthorn lotion!